Perhaps you haven't read the sad story of what happened to my hair. Years ago, it was quite strong, with natural waves and a brilliant auburn color. I was regularly stopped on the street on my way to work by strangers asking who did my body wave (there was NO body wave) or colored my hair (the shade was my own). I simply washed it with Nexxus Shampoo and moisturized with one of their conditione...read morers (this was when the products were only available in salons and the formulas were exceptional; I willingly paid a small fortune for their items). A famous stylist in my city loved my hair and suggested that I use artificial coloring to make it even stunning. In my naiveté, I allowed him to color it, and I realized that the peroxide and ammonia penetrated the hair shaft. It was never as resilient again, and I was resentful. Shortly afterward, I had a mishap during surgery and was given injections and oral doses of Prednisone for pain; there was no other way to function. The steroids basically destroyed my once-gorgeous hair. It began to thin, break easily (especially at the ends), and never had the multi-tonal hue or shine it once had. I needed major help. I believe that Phyto once advertised itself as a "vegetable bandage for hair." 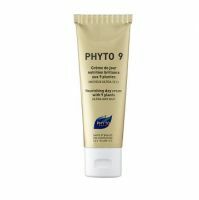 I washed with the luxurious, splendid "Phytojoba Shampoo" and turned to "Phyto 9 Daily Ultra Nourishing Botanical Cream" for ultra-dry hair ($28.00 at Sephora). The ingredients read like a dream diary for organic nourishment: It is packed with Macadamia Nut Oil, Rosemary, Burdock, Sage, Calendula, Willow, Mallow, and St. John's Wort: These work overtime to penetrate the hair shaft and mend it (it is a leave-in conditioner). You simply apply a pea-size drop and work through hair, concentrating on ends. It is completely oil-free, but it is extremely powerful when it comes to mending dull, dry, frail hair. I stayed on the Phyto regimen for a long time, using only their products, until I looked "human" again. Now I can use less costly but effective items to keep my hair healthy. This cream was a life-saver for my damaged tresses! I love this stuff! I have thick, wavy hair and use this leave in conditioner as a styling product (without blow drying). I couldn't tell much of a difference between Phyto 7 and Phyto 9, though. The smell is very natural (light nutty smell) and almost unscented. I use these in addition to a rinse-out conditioner. WORKS GREAT!! I do not use all the time, but when I do the frizzes are GONE!! Love the light fragrance as well.